While I was visiting family and friends over the holidays in Los Angeles, my pal Janel took me to a wonderful yarn store called A Mano. The two women who run this place are the greatest and the store had the nicest vibe with people sitting around chatting and knitting. It was the friendliest yarn store I’d ever seen. So, of course, I had to buy something! I’ve been wanting to learn how to make socks and Janel was buying some sock yarn so I did too. 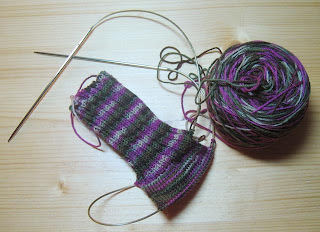 Now I’m making these socks with Lorna’s Lace’s sock yarn. 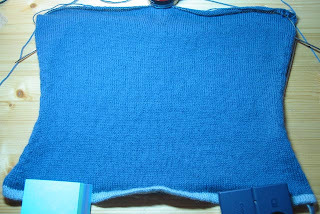 And here’s a quick progress update on my Union Square Market sweater. I’ve just gotten to the armholes and have divided the front and back which means I can now lay it out flat. Do you like my method of blocking with crap (post-it pad, battery charger & container of binder clips) sitting on my desk??? So I’m pretty late in sharing my total score of Christmas loot. 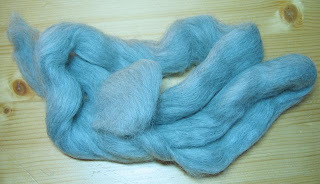 My friends and family completely spoiled me and I got some great fiber/knitting stuff over the holidays. 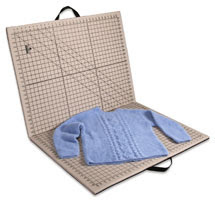 I can finally block things with this great blocking board from KnitPicks. 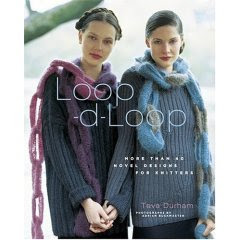 I can now knit the Lace Leaf Sweater since I got Teva Durham’s book “Loop-d-Loop” which has that and several other groovy patterns that I hope to make someday when I actually know how to knit better. My good friend Janel who runs Chameleon Colorworks overwhelmed me with spinning supplies. 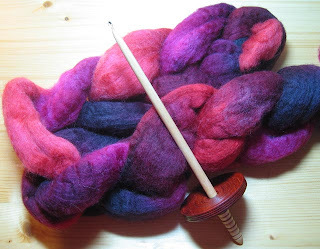 I got a pound of this luscious Blue Faced Leicester fiber in the black cherry colorway as well as this beautiful bottom-whorl spindle. 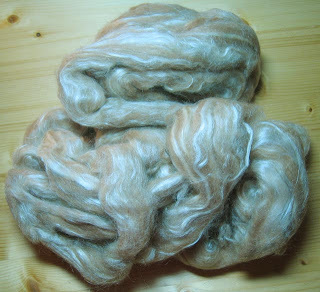 And then she also gave me some super luxurious samples of exotic fibers – baby alpaca and baby camel with silk! I wish this blog had “touch-o-rama” capabilities because these are like buttah!